I recently read multiple articles which argue that praising kids too much may lead to narcissism. Not that this is anything new, mind you. At least, not to parents like me who remember a similar conclusion drawn by Pixar in a 2004 film. You know, the one that spouted, “When everyone’s Super, no one is.” But I digress. Fortunately, I don’t think my kids have to worry about being narcissists. Unfortunately, however, it’s because overpraising them is not my problem. Often I’m so focused on correcting them – you know, in my efforts to help them grow up to be Jesus-loving, law-abiding, well-mannered members of society – that I forget my kids need, crave even, praise. And they don’t just need equal amounts of praise and correction, but greater amounts of praise than correction. In fact, did you know that there’s an ideal praise-to-criticism ratio? According to an article in the Harvard Business Review, the ideal ratio of positive and negative comments should be 5.6 to 1. I didn’t realize just how poorly I was failing until I read that. Gee thanks, Harvard. So how am I working to improve my ratio? How am I seeking to do better at living out with my kids the biblical encouragement of 1 Thessalonians 5:11 to “encourage one another and build one another up”? If there’s one thing I receive the most comments on from my book, Team Us: Marriage Together, it’s the Communication Sandwich. If you haven’t heard of this technique, it means that when you have constructive criticism to share with someone, you sandwich it between praise and affirmation. Much like you’d place liverwurst – or whatever meat you’d prefer not to eat – between two slices of homemade, fresh-from-the-oven sourdough bread, or between two fresh Krispy Kreme donuts, if that’s your thing. I’ve come to realize that just as Ted and I serve each other communication sandwiches in our marriage, we can also serve them to our kids. It offers a great way to remember to feed our kids praise and affirm what they are doing well, as we also correct as needed. 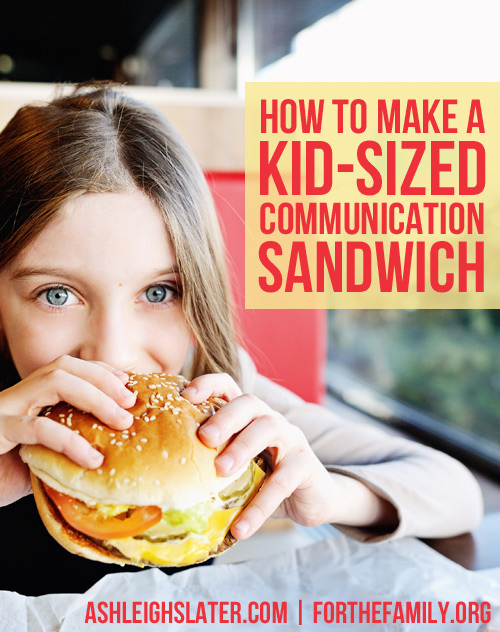 So how can you too make kid-sized communication sandwiches? Let me give you an example. Here’s one I’ve making a lot lately while I drive. And I do mean, a lot. Girls, I love that you are so happy and that you’re enjoying the car ride. It’s nice to hear you getting along well with each other. But I feel like you’re being a bit too loud for this small space. I’m having trouble concentrating on the road. Could you bring the volume down, please? It sure is fun to have sisters sitting next to you during car rides, huh? You all are doing a wonderful job at appreciating each other. You’ll notice that I affirm my kids for getting along and having good attitudes. After all, these are both positive, praise-worthy behaviors. And, since there are lots of incidents when they are fighting in the car, rather than enjoying each other’s company, this is an accomplishment on their parts. Next, I mention that “I feel like” they are being too loud. Rather than making it an objective truth – although, it really is – I focus on how the noise level is personally affecting me. Finally, I close my sandwich with that final piece of affirmation. I once again recognize how well they are getting along. Like I said, a noteworthy accomplishment. Sure, the communication sandwich may not offer that ideal 5.6 to 1 ratio, but it definitely helps me be more purposeful to feed my kids praise. And perhaps, if you too struggle to affirm more than you correct, it’ll increase your ratio too.